My new favorite pattern - the Burberry Inspired Cowl. It may not look like much but... What it is is fantastic! 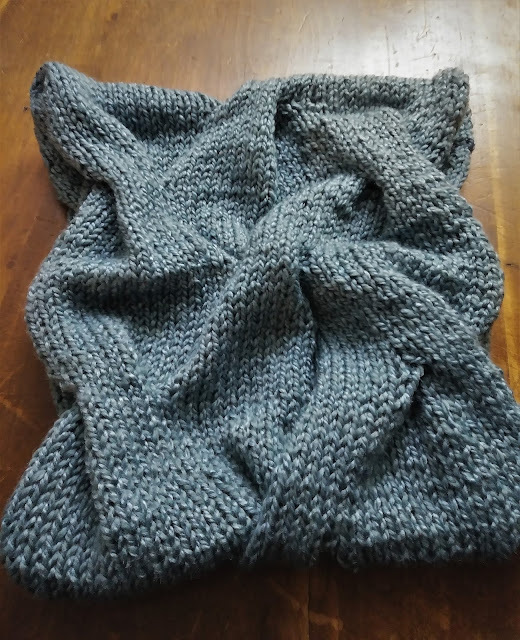 It's a simple, once around the neck cowl, knit with worsted weight yarn on slightly too large needles with cables spread over 16 stitches and 30 rows. Because the cables are so large and so spread out, you really don't 'see' them as cables. They look more like folds than cables. And the whole thing is knit with a fairly loose gauge so the resulting fabric is soft and drapey. And want to talk about soft? I used Berroco Ginkgo that I picked up recently at my new local yarn shop, The Center of the Yarniverse. The yarn is a 52% silk and 48% wool blend and is Heaven in a skein. I loved the pattern so much, I cast on a second cowl the same day I finished this one. And the whole time I've been knitting the second one, I've been thinking about what yarn I have stashed that would work for a third. Or maybe I should just go yarn shopping. Again. I marked that cowl when I first starting visiting Rav, I must have taken it off my queue at some point. Now I am revising it, thanks for the review! That looks like a great pattern - thanks for the link. Love the color yarn you are using. I LOVE that kind of cowl! It looks just great, and I think I may need to knit one SOON. It is lovely and looks so cozy! gorgeous and it looks so squishy soft!! I can't seem to get anything finished but that is most definitely going in the queue! That is lovely. And I adore the word "yarniverse:!